Preheat oven to 350°F. Put the Nature Valley™ granola bars in a food processor and process until you achieve a fine crumb. Reserve half of the crumbs (about 3/4 cup) for topping. In a large bowl, combine remaining crumbs with the brown sugar, flour and melted butter. Spread crumb mixture into an 8x8-inch baking dish that has been covered with parchment paper and bake at 350°F for 10 minutes. Let cool. In another bowl, mix squeezed lemon juice and softened cream cheese. Mix on low speed until incorporated. Add heavy cream mixture. Fold the fresh strawberries into the cream mixture. In a buttered glass dish, press the butter-crumb crust mixture on the bottom. 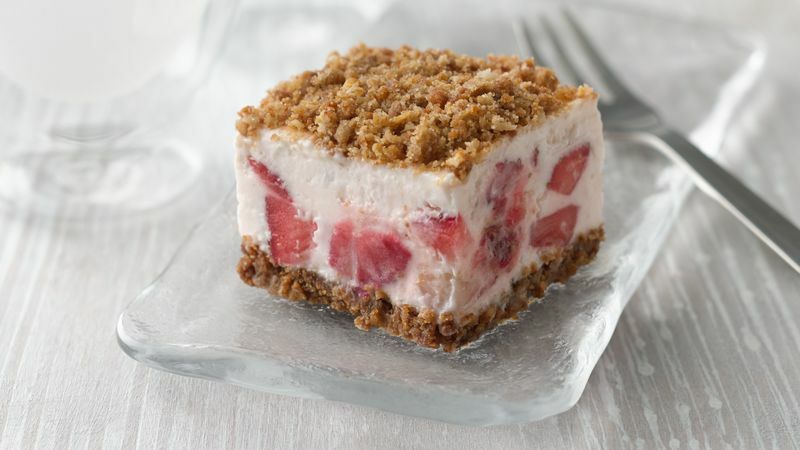 Top with strawberry mix and then add the reserved granola crumbs to the top. Cut bars before completely frozen - about 1-1/2 hours in the freezer.